Be the first to share your favorite memory, photo or story of Lil' Robert. This memorial page is dedicated for family, friends and future generations to celebrate the life of their loved one. 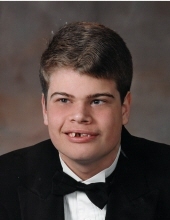 Lil’ Robert Everett Barding, 36, of Petal passed away on January, 23, 2019 at Merit Health Wesley. Services will be Saturday, January 26, 2019 at 11:30 A.M. at Macedonia Baptist Church followed by burial in Macedonia Baptist Church Cemetery. Lil’ Robert loved to watch Wheel of Fortune, and play ball. He never met a stranger, and always left people smiling. He was preceded in death by his paternal grandparents, James E. and Mable L. Barding; and his maternal grandparents, Sidney and Ginger Brady. He is survived by his father, Robert (Gina) Barding of Petal; his mother, Lisa (Ricky) Richardson of Petal; his siblings, Ashley (Todd) Johnson of Petal, Travis Barding of Houston, TX, and Kylie (Logan) Cofield of Petal; and two nieces, Ivy Rose Johnson, and Ella Grace Cofield. Visitation will be Friday, January 25, 2019 from 5 P.M. until 8 P.M. at Macedonia Baptist Church. In lieu of flowers the family ask that donations be made to the A.R.C. of Forrest County at 65 Bonhomie Rd. Hattiesburg, MS. 39401. To send flowers or a remembrance gift to the family of Lil' Robert Everett Barding, please visit our Tribute Store. "Email Address" would like to share the life celebration of Lil' Robert Everett Barding. Click on the "link" to go to share a favorite memory or leave a condolence message for the family.